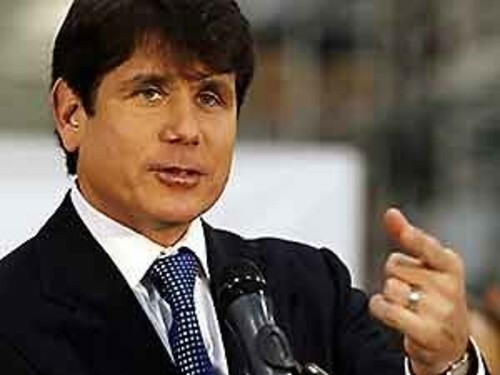 …and we’re sure ex-gov Blagojevich won’t mind the familiar reference. He is, after all, going to make a lot of new friends from so many interesting walks of life. In federal prison they might call him Rod, or Roddy, or even Blago… Or something else less wholesome. The verdicts came in, the pundits had their say, and now we await the sentencing. How much time will Blago get? Will he lose his state pension (it might seem obvious, but ex-Governor and current inmate George Ryan held on to his)? What will become of the Blago children? Blago was in rare form the other day. After the deadlocked jury could only convict him on one count (lying to to the feds – but hey, he’s a politician and it goes with the job description) causing a mistrial and retrial to come, he stood their and lambasted Patrick Fitzgerald and the U.S. Attorney’s Office, accusing them of “persecution”. Never mind that he’s now a convicted felon. He talked of “policemen gunned down in the streets” and “children who can’t play in their front yards”. Never mind that it was his so-called leadership and political strategy that led Illinois to its current $13 billion deficit, stretching law enforcement across the state to the breaking point, expanding so many’s dependence on government programs that they cannot function without their monthly taxpayer provided checks. In a move designed to do nothing so much as affect the jurors in his eventual criminal trial, the Blago went uptown yesterday, as in Manhattan. It was Good Morning America, Today, the View, Larry King. Yes, he finally received the kind of national media attention he’s been pursuing for so long. This as the Illinois Senate began his impeachment trial. Note: You may have to go to the blog site to view the youtube clip. This, then, is the turning point. The Hair is no longer sacrosanct. If you will permit us this metaphor, that the Blago’s public life is now like a man falling down a very long flight of stairs, then the defiling of the Hair is the moment in which he finally loses his balance and begins to plummet. A sad moment indeed. A governor who knows his poetry. Yes, in two out of three recent press conferences, Illinois Governor ‘Lightning’ Rod Blagojevich has ended with verse fit to warm the heart of even the most jaded English major. First it was Rudyard Kipling; last Friday, Alfred, Lord Tennyson. Stick to the classics, baby. If he can find a way to quote Oscar Wilde in his next press conference, all bets are off. Never mind his mountain lion release policy for controlling the deer and pesky rural voter population, we’re on board with the next reelection campaign. Sign us up!